Photography in education involves the use of photographs to engage research participants in representing and reflecting upon their own experiences. 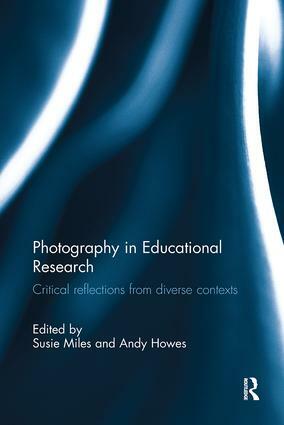 This book explores how photographic images can be used in a range of educational settings in different cultural contexts, as a method of facilitating communication and reflection on significant issues in people’s lives. It considers the opportunities that are created through the use of photography as a visual research method, and addresses fundamental issues about identity, representation, participation and power which underlie participatory practice. Bringing together a variety of international contributors, chapters describe and reflect on experiences of using photography, situating them in a critical framework to provoke informed applications of these processes. The collection adopts a broad view of education, considering voices of people of different ages who are at various stages on their educational journey, or who have diverse perspectives on their educational experience: young British Muslims, trainee science teachers, audiologists, teachers of deaf children, mobile teacher educators working in conflict zones, young people with disabilities, community workers and school students, in countries as diverse as Australia, Burma, Cyprus, England, Ethiopia, Kenya, the United States and Sudan. Photography in Educational Research will be key reading for educational researchers, postgraduate students studying research methods and ethics, tutors working in higher education, and individual practitioners and teams within schools interested in young people’s voices, ethnicity, mental health, global citizenship and school development.